In this week’s EdTech Situation Room podcast (tomorrow/Wednesday evening at 9 pm Central / 8 pm Mountain) I’m going to share several new space related features in Google Earth as well as some new Google Maps mashups (at least new to me) that can be used in the classroom to interactively explore and discuss current nuclear war risks as well as nuclear history around planet earth. In this post I’ll summarize what I plan to share on the show, along with related and supporting web links. First of all, everyone should know that as of April 2017 Google Earth has become largely web-based. This 55 second video from Google provides an overview. Wow! With Earth for Chrome, Chromebook users are no longer geographically crippled when it comes to exploring many of the features of Google Earth previously reserved only to computers running MacOS or MS Windows. The desktop version of Google Earth (Google Earth Pro) still has some unique features, but the Chrome version is pretty robust and amazing. Google Earth Pro used to require an authorization code to unlock all its features, but it’s now entirely free for everyone, as is Earth for Chrome. Yesterday (16 October 2017) Google announced some exciting updates to Google Earth which are accessible just in Earth for Chrome. In the official post, “Space out with planets in Google Maps,” Google announced the availability of “12 new worlds” in our solar system to explore via Google Earth. These include the recognized 8 planets of our solar system, as well as 4 more moons photographed in detail by the 20 year long Cassini mission to Saturn. Point your browser over to www.google.com/maps/space/earth to get started. Google Earth Pro (the desktop version) continues to have Google Sky, Google Moon and Google Mars, which allow for some solar system exploration, but the updates in Earth for Chrome are more extensive and utilize lots of NASA photographs of these 12 celestial bodies. Tips and tutorials about navigating both versions of Google Earth are available on support.google.com/earth/. Head over to www.google.com/help/maps/education/ for more Google Earth related classroom resources. The other GeoMap resources I’m going to share on @edtechSR tomorrow night are Nukemap: An Interactive Simulator and MISSILEMAP, both by Alex Wellerstein (@wellerstein). Recent tweets by U.S. President Donald Trump have been interpreted by many as physical threats to North Korea. The Prime Minister of North Korea has interpreted these tweets as a declaration of war by the United States. These alarming tweets have raised a number of issues, with the biggest being the potential for a nuclear exchange between North Korea and the United States. It’s also raised issues with Twitter’s rules and policies for users, which generally prohibit tweets that are physically threatening to others. Because of the “public interest” of these Tweets from President Trump, however, Twitter has not removed them. If you’re discussing or might discuss these issues with your students, consider using the Google Maps mashup sites Nukemap and MISSILEMAP. MISSILEMAP now includes an option as a “Launch Preset” to select the unclassified capability of North Korea’s nuclear missile arsenal. I was surprised to see that includes the range to strike about half of the United States, but not yet our east coast. Of course this is “just” one analyst’s opinion, based on careful research, and it could be wrong. This August New York Times article (updated on Sept 3rd) breaks down the engineering challenges facing North Korea, which include successfully using a delivery vehicle on the top of a rocket that can survive atmospheric reentry. 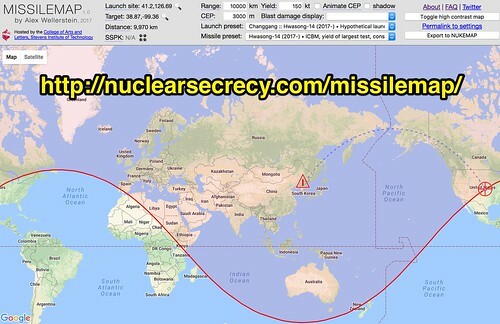 MISSILEMAP provides an export button to NukeMap which then permits users to select the “yield” of the nuclear warhead and the projected effects of the blast on the selected location, which accounts for actual demographics. Other factors can be changed as well, like whether the nuclear detonation is a surface blast or an airburst. It may seem macabre to interactively explore nuclear war scenarios using Google Maps with students. Depending on the age of students and your teaching context, it may not be appropriate. If, however, you are teaching older students and discussing current world events, I’d argue discussions about possible nuclear confrontation between the United States and North Korea is very relevant and important. These interactive map resources can provide you with useful teaching tools to visually focus classroom conversations and writing assignments, and can empower your students to use statistics, measurements, and logic to discuss the variety of issues raised in this general topic with greater background knowledge and facts. Consider also checking out the useful resources Alex Wellerstein has collected for teachers on his Nuclear Secrecy Blog as well as personal website. As someone who debated competitively for four years in college, I’ll close by noting nuclear war scenarios (always common in policy and cross examination debate) have never been more realistic than they are today. As teachers, if we think it’s challenging to talk with students about the recent shooting in Las Vegas or school shooting incidents (sadly not limited to the United States) it’s even more difficult to think about having to emotionally deal with a nuclear strike against our country or anywhere else. Memories of the horrors of World War II have faded in the minds of most living citizens of our country today, and too few appear to understand or care about just war theory, the Universal Declaration of Human Rights, or the moral imperative to protect noncombatants in wartime. Let us hope and pray our leaders can defuse tensions and avert a nuclear crisis.